It's that time again, the next event is in the starting blocks. This time we are with our neighbors in Austria, more precisely in Vienna. 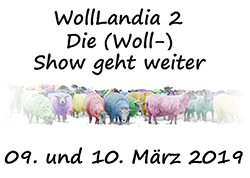 For the third time now, the Wiener Woll- und Stofffest (Vienna Wool and Fabric Festival) will take place this year. From Saturday, 03.11. until Sunday, 04.11.2018, we offer you our precious yarns with yak, silk, kid mohair, cashmere, baby alpaca and fine merino wool, which you have to knit and crochet. We have worked hard over the last few weeks and present our autumn/winter collection in Vienna. You can look forward to what we have prepared for you. We have taken over your user data from the old to the new shop system. You should be able to log in to the new system without any problems using your old access data. If this fails unexpectedly, you can always use the Forgot password function in the Login menu to reset your password. As we already reported, we have subjected our webshop to a fresh cell therapy and completely renewed the shop software. Not all new features are fully available, but our focus has been on more comfortable use, which is already in place. As with anything new, the subtleties lie in the detail, but also the mistakes, which we may not have discovered yet. Please be patient and notify us immediately should any difficulties arise.